Please note: The second section of this tour (from Vic Falls to Nairobi) runs as a combination of the Camping and the Accommodated tour. 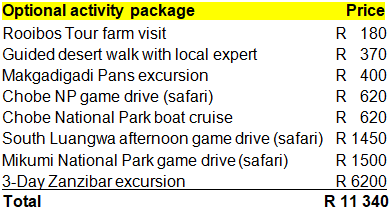 This means that there will be camping AND accommodated clients on that section of the tour (the last 21 days), with the only big difference being that the campers camp at night and those who booked the accommodated tour will have a room at the lodge/ hotel for the night. GER: German translator available for the first 20 days of this tour (from Cape Town to Vic Falls). The whole tour is still run in English.